Philosophy have created an at home micro-dermadrasion peel. Micro-dermabrasion is usually something you would go to your beautician for. It is a facial exfoliation procedure in which the top layer of skin is abraded away with ultra fine crystals of aluminum oxide or other ingredients. This process improves and smooths skin surface and can minimize imperfections, like blemishes, fine lines, and signs of sun damage. What is a Micro-delivery peel? It is similar to micro-dermabrasion in that it resurfaces the skin, it is just achieved using a peel with crystals and a activator gel rather than just dry crystals. Micro-delivery peel is also designed to replenish the skin with vitamin c, says Philosophy. Philosophy apparently carried out clinical trials and its results show that after just one micro-delivery peel, 82% of respondents agreed their skin appeared to be resurfaced; 65% of respondents agreed their skin felt brand new; 80% said their skin felt smoother and more refined. Peptide/vitamin c crystals: peg-6, sodium bicarbonate, oleth-20, glyceryl stearate se, silica, magnesium ascorbyl phosphate, retinyl palmitate, ethylhexyl palmitate, citrus aurantium dulcis (orange) oil, tocopheryl acetate, sorbitan isostearate, tribehenin, palmitoyl, oligopeptide, isopropylparaben, isobutylparaben, butylparaben, methylparaben, propylparaben, beta-caroteneactivation gel: water (aqua), lactic acid, hydroxyethylcellulose, linoleamidopropyl pg-dimonium chloride phosphate, propylene glycol, salicylic acid, diazolidinyl urea, polyquaternium 10, methylparaben, propylparaben. First apply vitamin c crystals to a clean dry face. Gently massage using circular motions to buff away dead, dry skin cells for thirty to sixty seconds; and then leave on skin for one to three minutes. Apply a thin layer of activator gel over crystals. After applying activator gel, a warming sensation and foam will appear. Leave on for one minute and then rinse. Micro-delivery peel seems like a superior product. Nearly everyone who has tried it found it transformed their skin from dry and rough, to smooth and soft. I think if you are considering using this peel you should check ingredients to make sure your skin will be able to tolerate the content. As a couple of patrons found it made them breakout shortly after use. The price is quite reasonable at $40 for a 2pc 1oz set or $65 for a 2oz. If you went to the spa for a micro peel it would cost over twice as much for one treatment, where as you can do this your self when ever. 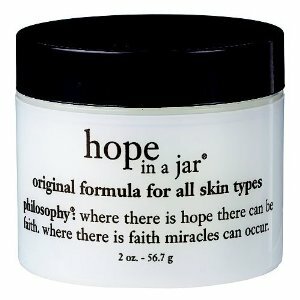 Philosphy's Hope in a Jar appears to be aptly named given the mixed reviews of this product. Some adore and others loath it, so it seems you just have to try this product and hope for the best. It is a daily facial moisturizer and Philosophy say it is suitable for all skin types, although numerous individuals have experienced some side effects such as flaky skin. However, for everyone that has a side effect, there's someone else singing its praises. Philosphy claims the cream will reduce wrinkles, smooth and hydrate skin in days. Whereas some ladies using it found that it can take a few weeks for the smoothing effects to kick in, possibly as your skin adjusts to the moisturizer. It is available with SPF which I would recommend as this prevents sun damage and you can also get it for dry sensitive skin too. Some have described it as being a bit too heavy for oily skin so may block pores, and their are mixed opinions over whether the product feels greasy or not. This moisturizer is not a good choice for fans of natural ingredients as it is packed with a variety of synthetic chemicals. Chemically enhanced moisturizers are very common, so this doesn't necessarily scream danger, but it has resulted in adverse reactions in some people. Check the ingredient list to ensure you aren't allergic to any of the chemicals, and if you are unsure it may be worth trying the product on your neck for a few days to see how your skin reacts. Every girl is different, and what works for one skin type won't work for another. The smell of this product has caused some complaints. While some don't seem to notice or even like the smell, others have described it as a 'rancid citrus fruit smell' so be warned. Typically it is described as a medicinal smell, likely as a result of the many synthetic chemical ingredients. Lauryl Lactate,Behenic Acid, Behenoxy Dimethicone, Glyceryl Stearate Se, Glycerin, Behenyl Alcohol, Cyclomethicone,Pentaerythrityl Tetracaprylate/Tetracaprate, Tocopheryl Acetate, Benzyl Alcohol, Retinyl Palmitate, Stearic Acid, Panthenol, Betaglucan, Lavender Oil, Diazolidinyl Urea. The 'Hope in a Jar' moisturizer can lean on the more expensive side of the fence depending on where you get it. However, it is an Amazon bestseller with many people singing its praises. Despite that there's just as many people disappointed with the product. It is just one of those try it and see kind of products. It is available in 4oz, 2oz and 0.5oz and ranges in price from $20 - $60 depending on where you buy it.